Five settings of torque reduction and brake intervention facilitate maximum grip. Standard on Grand Sport and Z06 and available on Stingray equipped with the Z51 Performance Package and Magnetic Selective Ride Control. A functional hood air extractor features precisely angled blades for optimal cooling airflow. The result is reduced lift and increased downforce, improving high-speed handling. The available Z51 Performance Package includes dual brake ducts that direct air through the wheelwells, cooling the front brakes and reducing brake fade for optimal stopping performance. All Stingray and Grand Sport models are powered by an engineering jewel, the 6.2-liter engine, a descendant of the legendary small block V8. It offers horsepower ranging from 455 in Stingray to 650 in the LT4 powering Z06. Features brilliantly sculpted headlamps and taillamps that emanate crisp, bright color and provide optimal lighting performance. 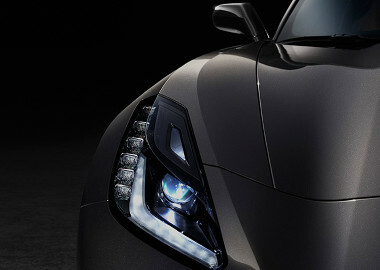 The iconic Corvette crossed-flags logo shown on Stingray in Shark Gray Metallic. 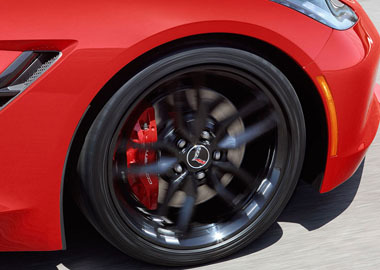 Corvette Stingray shown with available Black wheels, Red brake calipers and Z51 Performance Package. The Stingray cockpit features sweeping free-form lines, authentic materials and intuitive instruments, including two 8-inch diagonal LCD screens and an available Head-Up Display that projects data into your line of sight. The standard Grand Touring seat and available Competition Sport seat each feature a lightweight magnesium frame for optimal support. Stingray keeps you connected and entertained with a retractable 8-inch diagonal Chevrolet MyLink color touch-screen. Using steering wheel controls, hand gesture recognition and voice recognition capabilities, you can talk, text and stream music without taking your hands off the wheel. Apple CarPlay ta™kes the iPhone features that are useful to use while driving and puts them on the vehicle’s display in a clean, simple way. This allows you to make calls, send and receive messages and listen to music right from your touch-screen or by voice using Siri. Apple CarPlay™ supported apps include Phone, Messages, Maps, Music and compatible third-party apps. Stingray employs a host of safety technologies to help keep you safe before, during and after a possible collision, including an available head-up display that projects critical information onto your windshield so you can keep your eyes on the road. Stingray helps to prevent potential danger with features like Active Handling, 4-wheel antilock brakes and Traction Control. Standard Xenon high-intensity discharge headlamps help visibility by emanating 900 lumens of light. And if Stingray ever loses tire pressure, run-flat tires enable safe functioning at a moderate speed until the tire can be repaired. In the event of a collision, Stingray is designed to help keep you and your passengers safe with seat-mounted head and thorax air bags and a rigid aluminum frame structure that is lighter and stiffer than that found in previous-generation Corvette models. You’re never alone with OnStar® Automatic Crash Response. Built-in sensors can automatically alert an OnStar Advisor, who is immediately connected into your vehicle and can request emergency help be sent to your exact GPS location – even if you’re unable to respond. Standard for the first six months.